Our Burlington Dental office is devoted to providing comfort and excellence in every aspect of your dental care. We have a highly trained professional team who work to provide you with the knowledge to help you make decisions for your dental care. Your individual needs are always considered, your choices respected. Houston Dental has been devoted to providing comfort and excellence in every aspect of your dental care for over 25 years to the Burlington community. 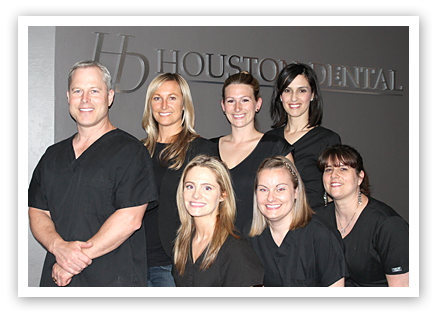 Houston Dental will help create the perfect smile you have been looking for. Boost your confidence and physical appearance with the wide range of cosmetic dentistry services available. We use the most modern and advanced technology available in the dental industry to treat our patients. Our technology helps diagnose and treat our patients accurately and early before serious problems can occur. Comprehensive dental exams at our dental office involve a physical examination of your every tooth, gums and overall oral health. There are many preventive measures you should take to maintain a healthy smile. You will be evaluated and examined to determine the specific requirements for orthodontic treatment. Options are available from traditional braces to clear Invisalign braces. Dr. Tom Houston is a member of the Ontario Dental Association, Canadian Dental Association, Academy of General Dentistry and Burlington Dental Academy. Let Us Be Your Burlington Dentist !